Nerimbera Alpacas have been providing a private transport arrangement for our farm for the last couple of years. They are now offering transporting services to the small livestock industry with a dedicated transport vehicle for this purpose. 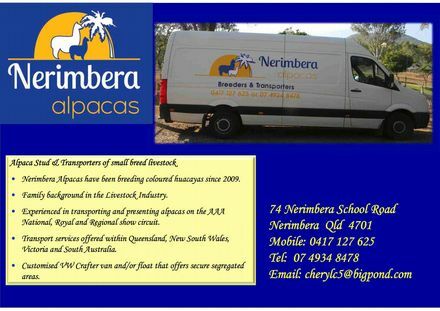 Nerimbera have had a lot of experience in transporting alpacas, both their own and others, to shows, vets, between farms for matings and at distance. As well as having bred alpacas themselves for many years, they also have an extensive family history in the livestock industry themselves - with sheep and horses. They are experienced with the obtaining the relevant paperwork for transporting animals to / from all States and also the DPI requirements for tick clearance, etc on their journey South at border crossings. The transport vehicle is routinely maintained, is in very good condition and reliable with adequate ventilation. They carry feed requirements with them and the animals arrive at their destination in peak condition. We highly recommend the services of Nerimbera Alpacas in transporting your livestock for matings; following a purchase; sending to your clients following a sale; agistment at other farms; to shows or for export, etc.